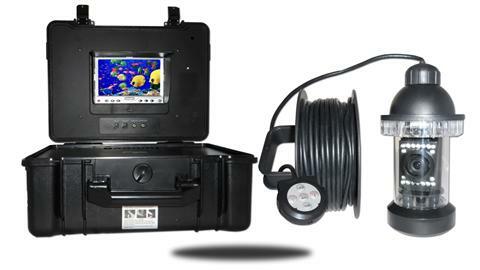 This is a great easy to carry underwater camera CASE system that allows you to see what's down below. Whether it's for fishing or just research, this color kit is a great way to go! You can see the ocean or lake in bright and vivid colors.The rechargeable battery allows you to use this for up to 14 hours without a need for any electric outlets. It is also expandable so you can add another camera as well. 7 Inch LCD screen monitor. Collapsible visor with reinforced sides. Waterproof camera equipped by Sony CCD module. Super strong waterproof ABS material carrying case. Cable storage spool serves as a carry handle when use. 360 Degree viewing rotating camera. Wired control FOB and wireless hand remote control. 10 pcs IR LED and 8 pcs white LED lights for low light viewing. This has a built in DVR as well, so it can record anything you see with the camera! The DVR supports up to 16GB of SD card.